This is a quick description of a patient I evaluated the other day that demonstrates the eclectic approach in action (and help show how Erson isn’t just making up stuff). I’ll try to keep it short and to the point. The patient is a 57 year old female who starting having right wrist pain in April. She complained of pain deep in her wrist and on top [dorsum] of her hand to her knuckles. She eventually saw a doctor in June who ordered “a whole bunch of tests” and no other treatment other than medications. The doctor ultimately performed a carpal tunnel release surgery in November. After the surgery, she complained of the same pain – the surgery had not changed her pain at all. Eventually, the doctor told her to try physical therapy. So, 8 months after she started getting pain (and 6 weeks after surgery), I evaluated her. 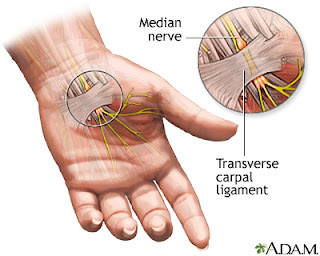 She still had the same pain complaints (deep in wrist and top of hand) and functionally she could barely hold/grip anything in her hand and minimally moved her wrist. In addition, she also said the area by the incision is very sensitive. I should also mention that when I went to shake her hand in the waiting room, she refused to do so because of the pain. She says she is somewhat ambidextrous – writes with left but does most other things righty. First, I tried out some repeated cervical retractions with left SB – I know it was FN when I assessed it, but I just wanted to make sure it wouldn’t change anything…and it didn’t (no harm in trying). Then I did some repeated passive shoulder extensions in sitting. This changed her UE 1 pattern to FP (only mild discomfort) and she was able to actively flex/ext her wrist more and with less pain. She was still a little skeptical of what I was doing, but she was starting to come around. Then I did IASTM to the lateral UE pattern, volar/dorsal aspect of forearm/wrist area and a little around the incision. After doing this, she was able to flex/ext her wrist even more (just about even to other side) with mild pain. Her UE 1 pattern was now FP (with “a little stretch feeling”). I also tested her grip strength again and it was now 28 lbs with less pain (a few minutes earlier it was 11 lbs). Now, she had bought into the treatment and that it’s not carpal tunnel – something to which I was alluding to throughout my conversation with her. I probably could have stopped there with significant improvements in ROM, grip strength, and pain, but I got a little excited and decided to try wrist flex/ext with mobility band wrapped around her forearm (from wrist to just below elbow). I did it a few times passively, then I had her do it a bunch of times actively. After I unwrapped the band, her passive wrist flex/ext was FP (mild discomfort at end-range); active wrist flex/ext was same pain but a little less than full motion. And when I tested her grip strength again, it was now 38 lbs and only mild discomfort. I should mention that throughout the treatment I was going over various pain science points (perception of threat, fear of movement, etc). For a HEP, I just gave her repeated shoulder extensions (10-20 x every hour and when symptoms increase) and told her to actively flex/ext her wrist throughout the day. So, in a matter of 10 minutes, I got her grip strength to go from 11 lbs to 38 lbs (other side was 45 lbs) without doing any “strengthening” and I got full PROM (with nearly full AROM) without doing any crazy, painful stretches. After we were done, I said goodbye to her and shook her hand and only afterwards did she realize she just shook my hand (something she refused to do when I first met her about 30 minutes ago because of pain/fear). And for those of you wondering if I talked about the carpal tunnel surgery being unnecessary, I did have the discussion with her. It wound up being a rather direct discussion because after she saw the improvements, she said “So, basically I had an unnecessary surgery.” I couldn’t deny that statement, so I agreed and said something along the lines of it happened, it’s in the past, let’s not dwell on that, let’s just move forward and get you better. As Erson would say, remember to keep it eclectic! Update: One week later, this patient came in and said she was feeling so much better and could use her hand a lot more - she could open up a jar and was able to push off a chair/couch to, which is something she hadn't done in months. Her grip strength when she came in was 40 lbs, so even better than when she left last time. And her ROM was near-normal with minimal pain at end-ranges. She said she didn't do the shoulder extensions that much, just a few times, but she moved her hand/wrist around all day long. We decided that she should continue with the HEP and further PT wasn't necessary. It's unfortunate she didn't #GetPT1st.